No Timers. Self Paced Course. Guaranteed to Pass. Now with Unlimited Retakes. Lowest Price Guaranteed in Washington State! Your Certificate is Valid for 2 Years. The amount of discount you will receive depends on your insurance company. As long as you have good driving record, you can generally save 5% - 15% monthly. 2. Who Can Take This Course? Washington Drivers who are 55 or older can take our course. You will receive an insurance discount by when you provider certificate to your insurance company. Our course is 8 Hours in length. You can finish at your own pace. We save your progress each step of the way. Just make sure you finish it within next 6 months! 4. How Will I Get My Certificate? Once you pass our course, we email your completion certificate to the email address you provided. We can even send it via FedEx if you need it urgently. 1. What is a Senior Drivers Course? Why take a Mature Driver Improvement Course? The Mature Driver Improvement Course provides instruction on defensive driving and Washington motor vehicle laws. During this course, information is provided on, but not limited to, the effects of aging on your driving, driver problem areas such as yielding the right of way, speeding, following distances, sharing the road, road signs, and signals, how to limit your distractions, how to properly use safety restraints (seat belts, air bags), what effects medications and alcohol can have on your driving and the importance of maintaining a safe vehicle. By taking a DMV licensed and approved Washington Mature Driver Improvement Course, you may qualify for reduced motor vehicle insurance premiums for 2 years (24 months). Please note: Washington law allows insurance companies to determine the percentage of premium reduction. 2. 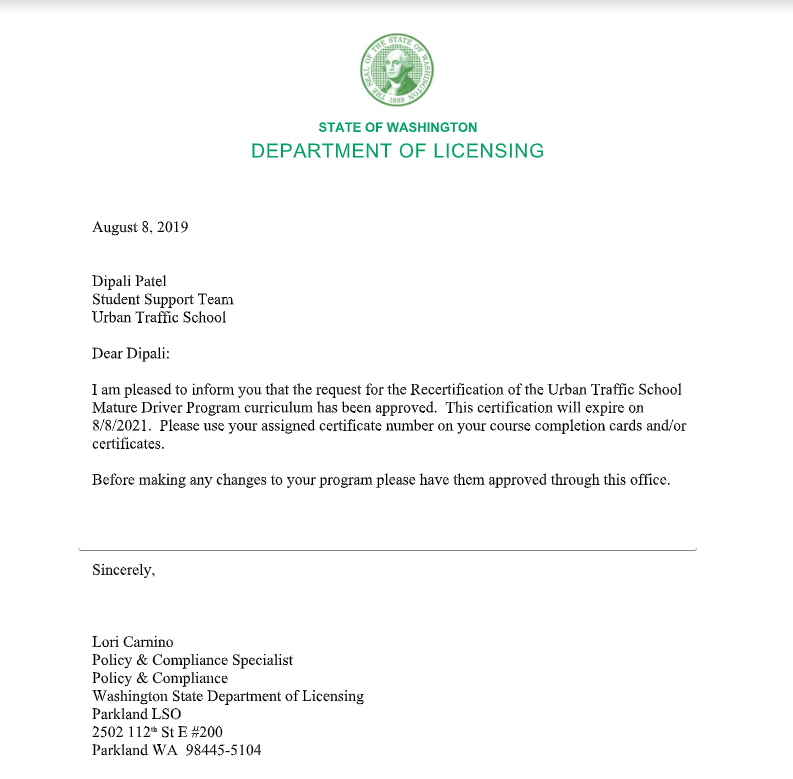 Is Urban Traffic School’s online Mature Driver Improvement Course approved by the Washington Department of Licensing? Yes! Our 8 Hours, online Mature Driver Improvement Course is licensed and approved by the Washington Department of Licensing. 3. How long will it take for me to finish Mature Driver Improvement Course that Urban Traffic School offers? Urban Traffic School’s Mature Driver Improvement course is contains 480 mins of instruction. Our course is entirely self-paced and does not need to be completed in one sitting. The benefit and luxury of taking a 100% online Mature Drivers Course is that you can start/finish whenever you want. A week later, a month later, 2 months later, no matter! You can log in and out, start and stop whenever convenient for you! 4. Who is eligible to take a Mature/Senior Driver Improvement Course? Licensed Washington drivers, 55 or older are eligible to take the Mature Driver Improvement Course. 5. What happens after I finish the course? Once you complete the Mature Driver Improvement Course, you will get proof of passing/completion via email. Your certificate will be delivered to the email address you listed when registering for the course. Please be certain to provide your full and correct mailing address when registering for the course. 6. How do I obtain my vehicle insurance premium discount? Once you have your certificate, provide it to your insurance company for vehicle insurance premium discount. **Please Note: The insurance carrier can refuse to give a reduced rate to those who have poor driving records. You may wish to ask your insurance company about your eligibility and the amount of discount prior to taking an approved mature Driver Improvement Course. 7. How long is my Mature Driver Improvement Course Certificate good for? The Mature Driver Improvement Course Certificate is good for 2 years (24 months) from issue date. 8. What if I fail the final exam? We provide unlimited retakes for the course at no extra fee. 9. What if I lose my Course Certificate and or it is accidentally damaged? If your hard copy Mature Driver Improvement Course Certificate is lost and or damaged and you want a replacement certificate, there is a $10 fee to replace and reissue the certificate with a new one. The Date of issue/completion does not change; it is listed as a duplicate certificate. 10. Why does Urban Traffic School Charge a replacement fee? Mature Driver Improvement Course certificates are hard copies and manually completed. We will need to retrieve your school copy, look up and verify the data, and then complete and reissue a new certificate and then resend to you via USPS. Our Online Mature Drivers Course is completely self paced. Log in and out of the course as many times as you'd like! Your progress is automatically saved. Whether you use a tablet, PC or a smart-phone, our online course works on all devices. You can study at home or work, at your convenience. Customer support is the backbone of our business. We provide phenomenal support via Live Chat, Email and Phone. If DMV or Court signals user's incorrect/missing information, we make every effort to contact your to resolve issue. We made our course as simple as possible. With five chapters to study and our practice quizzes, helps you get ready for the final exam. The final exam covers what you study in our course. With over 99% success rate, rest assured you are making the right choice choosing us. An online course at Urban Traffic School is easy to follow, fun to read and without any timers. Our final exam is 15 questions simple and contains common knowledge driving techniques. Moreover, you have two tries to pass the final exam. We have over 99% success rate with our final exams. An online course at Urban Traffic School is easy to follow, fun to read and without any timers. Our final exam is 25 questions simple and contains common knowledge driving techniques. Moreover, you have two tries to pass the final exam. We have over 99% success rate with our final exams. Signup now and get a complementary DMV Submission SMS notification. Automatically Added to your Course when you register today.